Julia Earl (Ph.D. Biological Sciences, Univ. of Missouri, 2012) builds spatially explicit individual-based models to determine how movement ecology affects spatio-temporal patterns of cross-ecosystem transfer of energy and nutrients (subsidies). 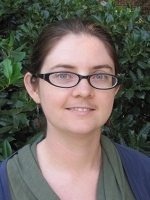 Upon completing her fellowship at NIMBioS, Dr. Earl accepted a position as a postdoctoral fellow in the Department of Natural Resource Ecology and Management at Oklahoma State University studying the effects of climate change on wildlife. Gray MJ, Brunner JL, Earl JE, Ariel E. In press (2015). Design and analyses of ranavirus studies with a focus on assessing risk. In: M.J. Gray and V.G. Chinchar, eds. Ranaviruses: Lethal Pathogens of Ectothermic Vertebrates. Springer. Earl JE. June 2014. Animals as ecosystem connectors: Does their movement path matter? Biomath Program, Fisk University, Nashville, TN. Earl JE. February 2014. Moving resources between systems: Reciprocal and active subsidies. Seminar, Oak Ridge National Lab, Oak Ridge, TN. Earl JE, Gray MJ. 2013. Capability of ranavirus to cause extinction in local populations of wood frogs. Wildlife Disease Association, Knoxville, TN. Earl JE. April 2013. Poster: Effects of animal movement ecology on the spatial distribution of active subsidies. Systems Ecology Symposium, University of Georgia's Odum School of Ecology. Earl J, Gray M, Sutton W, Miller D. 2013-2014. Determining the extinction probability for the most endangered frog in North America (Rana sevosa) following exposure to the emerging pathogen, ranavirus. Morris Animal Foundation Grant. $40,224. Accepted.